Case Western Reserve President Barbara R. Snyder served as chair of Business-Higher Education Forum (BHEF) in 2014, helping to focus its National Higher Education and Workforce Initiative on Data Science. Access BHEF's insightful case study on Creating A Minor In Applied Data Science‌ and learn how Case Western Reserve University is engaging business leaders to produce T-shaped Professionals. Alumnus and former Microsoft COO Bob Herbold commits multi-million dollar gift to help launch data science program at CWRU. Fortune magazine explores CWRU's new data science academic efforts in a recent article about 'big data' education. Studying evolutionary biology with the rigorousness of a historian and analyzing medical data set with the precision of a mathematician. These are the skills that the two newly approved majors, data science and origins science, are striving to foster at Case Western Reserve University (CWRU). Responding to the increasing academic trend of interdisciplinary studies, the two majors aim at bringing both sides of Euclid Avenue together. Check out The Observer's story on the new ADS minor here. Case Western Reserve University has launched a new institute dedicated to advancing research on the Internet of Things. The Institute for Smart, Secure and Connected Systems (ISSACS), will lead specific initiatives in data science, cyber security, networks, embedded systems and more. This new institute will help the university leverage its strengths in sensors and electronics, networks and communications, systems and control, data science and analytics - tapping into the Internet of Things (IoT). CWRU alumnus and former Microsoft COO Bob Herbold's $2.6 million commitment to a professorship helped launch the university’s data science initiative in 2014, and his new $1.5 million pledge for graduate student scholarships is a key element within the new institute. Visit this news item in The Daily to find out more about this initiative and the Internet of Things. Visit The Daily to find out more about the grant. Case Western Reserve University is one of three institutions nationwide to win federal “Big Data” grants focused on developing ways to ensure the integrity and comparability of the reams of information the U.S. health care system collects every day. If successful, the work could create enormous new opportunities to glean insights that help physicians cure or even prevent illness and disease. The National Institutes of Health is striving to address some of the challenges of disease treatment by tapping into the potential of big data, with its Big Data to Knowledge (BD2K) initiative, which last month awarded nearly $7 million in grants across four major areas. Case Western Reserve’s award—which is just over $900,000—was in the category of data provenance. 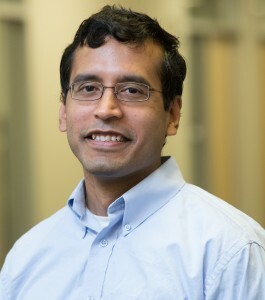 Satya Sahoo, assistant professor in the School of Medicine, leads a team that includes researchers from Harvard and UCLA to work with de-identified patient case data and to develop a platform that collects and analyzes disparate clinical information from multiple sources. George Lee, research assistant professor in the Center for Computational Imaging and Personalized Diagnostics (CCIPD), received a three-year K01 award through the National Institutes of Health Big Data to Knowledge (BD2K) initiative. The project is titled “Big data convergence of pathology and omics for disease prognosis.” Anant Madabhushi, director of CCIPD, is Lee’s primary mentor. Visit the full article in The Daily to find out more.